Pictures of the much talked about McQueen lobster claw shoes are starting to surface. Joe Zee tweeted about them today and the Vogue UK team gave them a run around the fashion cupboard. I wish I could take credit and say these were my lucky feet that were engulfed in all 12 inches of reptile skin, but these feet belong to British Vogue editors. Swoon! Lucky birds!! The Brit Voguettes compared them to a normal stiletto heel side by side and the McQueen clearly triumphed, making the other "high" heel look like a Barbie accessory. I once read somewhere that Marc Jacobs has a theory that if he can walk in the shoes that he sends down the runway, then so can his models. 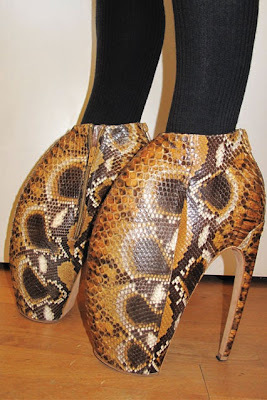 True or not, I have to wonder if McQueen tried these suckers on before he dangerously sent girls with weak, malnutritioned ankles down a runway with a live world stream for the whole world to watch. There were remarkably zero tumbles on the runway during the show. Genius.